The ECB800DB-1A is water-resistant for up to 100 metres and offers a full-dot STN display which enables a clear, high-resolution digital display of the alarm and 1/1000-second stopwatch functions. Additional features include a daily alarm, super illuminator, speed indicator, 200 lap memory, countdown timer, and more. 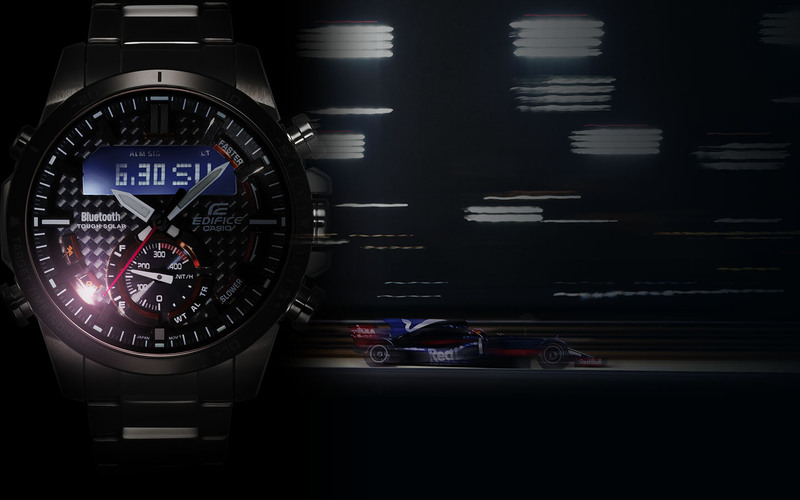 A HIGH SPEC CHRONOGRAPH THAT EVOLVED THROUGH MOTORSPORT. Adoption of a large LCD with a multi-functional display capability facilitated development of a chronograph dial combining analogue and digital displays. Features include a 1/1000-second measurement function that operates in conjunction with your smartphone.